Price includes breakfast and all taxes. Pets allowed for a fee 150 CZK per day. Children up to 12 years are free on extra bed in room with 2 adults. Parking available for 150 CZK per day. Reception is open only until 19pm - please let us know approximate time of your arrival. It is no problem to arrive later if you inform us in advance. Pension U Matesa in Cesky Krumlov is composed of eight houses in two groups on the bank of the Vltava river. Location under the Castle is very convenient and offers unique view of Cesky Krumlov. Very quiet part is near to the Castle and other parts of the historical center (across the river). Advantage is also private parking (for 150 CZK / car / day) right by the pension (other pensions in the center have to use public parking areas). All houses are split in two groups and buildings in each group are interconnected with each other. Main buildings were built in 16th century, others a bit later. Pension U Matesa group of houses includes three houses and another one about 15m by side. The oldest building used to be house of the weaver called Mates. Total capacity of this block is 12 rooms (up to 38 persons). Part of this block is a medieval restaurant with capacity for 25 persons and terrace for another 18 persons (breakfast for all clients is served here) and bar. It can also serve as a meeting room. Group of houses of former pension Labyrint is only about 50 meters from the group U Matesa and consist of four buildings with total capacity of 9 rooms (up to 22 persons). All buildings were reconstructed in 2003 or later to meet modern accommodation requirements. There are 21 rooms in all buildings. Rooms have nice views of the river and Cesky Krumlov Old Town or even Castle tower. Pension U Matesa in Cesky Krumlov allows you to bring your pet for a fee 150 CZK per day. Clients are kindly requested to advise aproximate time of arrival in advance. House on the adress Rybarska 23 was build in 16th century. Building underwent classical adapatations and another reconstruction on the break of 19th/20th centuries. Classical facade with decorative window frames are main historical features. It used to be house of the weaver called Mates (named after) who came here after tanner and brciklayer. Later cooper, weaver, bread salesman, starcher, locksmith and other burghers lived here. House on the adress Rybarska 24 was build in 18th century on the gounds of 16th century building. Classical facade with ponding haunch, a gable roof upright to the facade and frontispiece gable are main historical features. Parts of ground floor and cellar are vaulted. 1st floor has flat ceilings. It was reconstructed during 2nd world war. House belonged originaly to the hewer. Shoemaker, curriers, tanner, draper, tinsmith, stove man, knitter lived here intil 1740, when flood came. Later a labourer, greengrocer, furrier, soldier recruiter and ironmonger possessed the house. House on the adress Rybarska 13 was build in 18th century as an annex of neighbouring building (Rybarska 12). There is joist ceiling in one of three rooms of this ground floor classical building with smooth facade. Burghers used to live here in the time of reconstruction of building at Rybarska 12, later a labourer, a weaver and a bricklayer lived here. 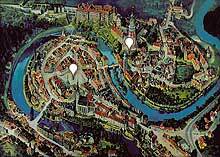 location in the very centre makes it an ideal base for discovering of Cesky Krumlov mysteries. Stylish restaurant with open fire place is a cosy space for a rest. well preserved building from the start of 17th century with renaissance and baroque features and interiors. Antique furniture evokes pleasant atmosphere.